1. A profound rainshadow over Seattle Sunday afternoon. 2. Strong winds over the entire region, with some locations getting gusts of up to 60 mph. Several power outages. 3. A powerful westerly surge today in the Strait of Juan de Fuca with winds reaching 50-60 mph in the central and eastern Strait, with northern Whidbey Island being hit hard. 4. Powerful winds in the Kittitas valley, with gusts above 50 mph. 5. A strong convergence zone from Seattle to Everett, bring heavy rain and lightning. 6. Heavy rains on the coast and the lower slopes of the mountains, but with heavy snow above 4000 ft, reaching 1-2 feet in some locations. 7. Highly accurate forecasts of much of the above, something we could not have done ten years ago. 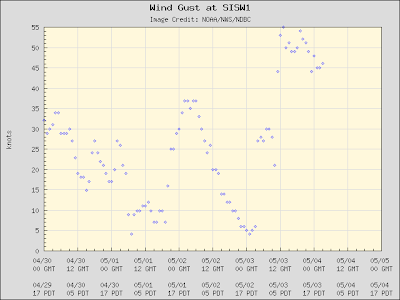 Take a look at the maximum gusts at Smith Island, just upstream of northern Whidbey Island. 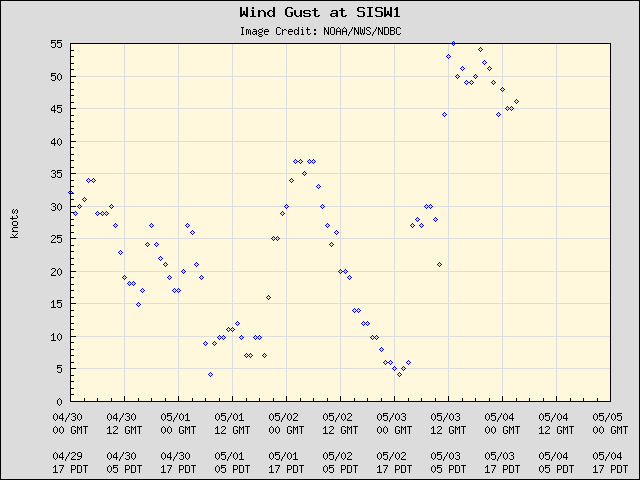 Twice the gusts reached 55 knots--that's 63 mph. Keystone Ferry runs were canceled and trees are down all over the island. The fact that many trees have leaves now makes them more vulnerable. With all the cold and snow lately the snowpack is really doing well. Take a look at the latest plot...and remember we were down to roughly 50% of normal a few weeks ago! Now everyone is above 75%, Yakima's watershed is above 100% and the Olympics are 140%. You will be able to water your lawn this summer. It is sobering to consider that the National Weather Service's long-range (month ahead) forecast was entirely WRONG about this last few weeks...they were going for warm and dry. The skill of extended forecasts are very low. Today we had the absolutely best convergence zone you could ask for. Look at these amazing radar and satellite images at around 1 PM. The satellite image shows the classic convergence zone line, with the zones of enhanced clearing to the north and south. 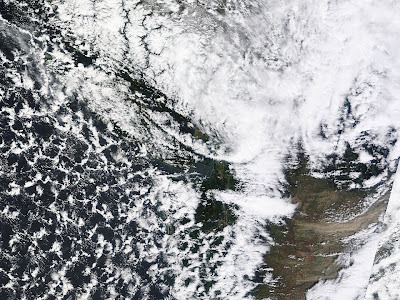 One extraordinary aspect of this convergence (and you can see it in the sat picture) is that the convergence zone clouds crossed the Cascades. You don't see that very often. Here is a high resolution MODIS image at nearly the same time. Amazing...you can see the dust storm in eastern Washington, and the Puget Sound Convergence Zone plume. I biked home this evening and had to penetrate the convergence zone north of the UW. Lightning was flashing in front of me. I was getting wet. And I could see the clearing on the other side as I turned into my street. Just wonderful.